How do I miss this stuff? I know I can rely on you to report the news in a more palatable (dare I say Jon Stewart-ish) fashion? And on the next day,did camo guy and his dog go after Grizzly bear? LOL..now this title got my attention. Awww dogs are the best, but cougars..not so much. Is he new & being initiated? Or did he lose a bet? You don't think that was in the job description?? One day someone will make the mistake of chasing a cougar after chasing a cougar. In my neck of the woods, we have alligators that have come to live in the bayou that runs through town. They started out smallish but now they are biggish. And those idiots that live in the condos and apartments along the bayou feed them, throw them food scraps. What about having an 8 foot alligator in their backyard don't they understand? It just looks like they're out for a friendly jog. Where are the tools, protective devices, implements, gear, and safety equipment? Maybe I'm over thinking this post. Maybe that cop was looking to add a little variety to his holiday feast. Of course, I'm sure that cougar was thinking the same thing about he and the dog. On a personal note, I hope your Thanksgiving holiday was a great one! I'm thankful to have found your site and gotten to know you a little through this crazy land called bloggyville. Not in a million years. Glad no one was hurt though. But not in a million years would I do this. Whoa! I'd say the cougar can go wherever he pleases. Perhaps a tazer would come in handy? Wow thats crazy! I feel lucky now that the biggest danger I face is an angry cat! Not really how you track a cougar. I guess he pulled the short straw on that chase. Sometimes I don't read your blog on purpose because I laugh so loud I'm afraid I'll get fired! Ellen must come from a small town similar to where I lived until I was 7 (Houma, Louisiana) where alligators were routinely found hangin' around. Somehow, though, I think cougars trump gators. Witty post. I think the job description should include "may have to chase a cougar with 10 or more friends--all carrying large caliber rifles." That cougar looks almost like its wearing a collar going for a stroll! We actually had a 19 year old woman attacked and killed by two coyotes about 6 weeks ago, something that we have never heard of before! You never know when you are hiking in the woods! Obviously their mistake was not hiring someone who can run 41 mph. I guess he drew the short straw. Scary for sure. Gosh-I have a serious fear of cougars and they totally live in my neck of the woods...er, mountains. Definitely my college mascot! Brave guy---glad the cougar was removed. But really-moving into the "wild"? So...what's to keep him from going back to where he was? Ww---not an assignment I would have liked to have been picked for! Fish & Wildlife Dept jobs are apparently far more stressful than I previously thought! Given chasing a cougar or working with a certain law firm partner from my past who shall remain unnamed? Cougar for the win, hands down. Even WITHOUT the dog. Seriously - who did that guy piss off? That is amazing and yet stupid! I feel badly for the guy and where are all his buddies? They sent him out with just a dog! I would have said NO WAY! I really just feel sorry for the dog in all of this. He could have been cat food. This is their amazing plan? It's like when you work at a department store, and no one tells you until it's too late that it's in your job description to clean up pee and or other excrement out of the dressing room, should that problem arise. Thats why I always worked the checkout! I bet if that dude is single there would be lots of ladies lining up to woo him, bada$$ wildlife officer that he is! At least you'd get fit. That is nutso. So...what exactly does he do now? I WAS WORRIED FOR THE DOG! I and thought you were talking in metaphor.. cougars' chasers... Oh that happens in Reno, not in Seattle I guess. *sigh* a cougar ate Farm cat Fred. Let us hope he had a Ruger Blackhawk in the waistband of those non-magic pants. I must move to Seattle and have my boyfriend get a job at the Washington State Department of Fish and Wildlife....also must take out new insurance policy...check and check! Cougars, alligators... I think the scariest thing you'll find in our NZ neck of the woods is a possum! why I resemble that remark...I wish. that is a freaking wild photo. the first thing I thought was "the damn cougar is gonna eat the dog!" so I'm with you!!!!! We need to let the cougars repopulate. Grrr.... Science Teacher unhappy! 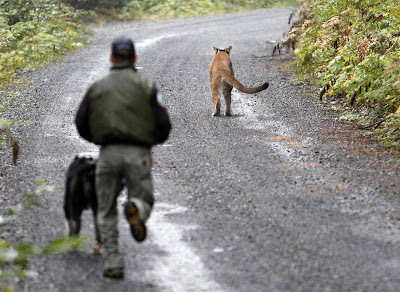 That cougar looks completely unconcerned about the person and dog following him. Oh big time scary visual right there! I sure hope he's armed. Very funny. I like the idea of this being part of an interview process. Ingenious! What? Is he going to tackle it? What exactly is the plan here?? I just wanna know how the capture occurred. I would not chase a cougar with a dog. I would not chase it with a hog. I would not chase him as I jog. I would not chase it through the fog. I would not chase it Sam I am. I'm glad I don't have that job. "Did you discuss this in the interview process? Why, yes!" That made me pee a little laughing.